One of the keys to a profitable flip lies in careful scheduling to tightly manage time. If you’re flipping your first properties, however, your lack of construction project management knowledge can make it challenging in determining the most time efficient order of operations. Where do you start? You likely purchased the property with an exciting picture in your mind of the finished product, but the amount of needed repairs that you came up with to get you there seems overwhelming. Two common reactions to this lack of experience are that you might jump in to work immediately with a hammer without a plan. Conversely, you may feel so crushed by the amount of work ahead of you that you do nothing while the clock runs and holding costs threaten to put you in the poorhouse. Neither reaction is appropriate, as it’s vitally important to take the time to understand how to work through the items on your list in the most efficient order in which to perform the repairs, so as to complete your project as quickly and cheaply as possible. This post attempts to provide a thorough explanation of the order of repairs that we use for planning our projects, though it’s important to note that every flip can vary considerably. That’s because every property has its own set of issues that can make repairs and scheduling unique to the project. What software should you use for planning and managing your house flip project? Since REIkit software’s strength is in-depth due diligence and deal marketing, allowing you to estimate your rehab costs in great detail, come up with the most accurate ARV, and market your deals to buyers and lenders, what is the best software for creating and managing your house flip project? 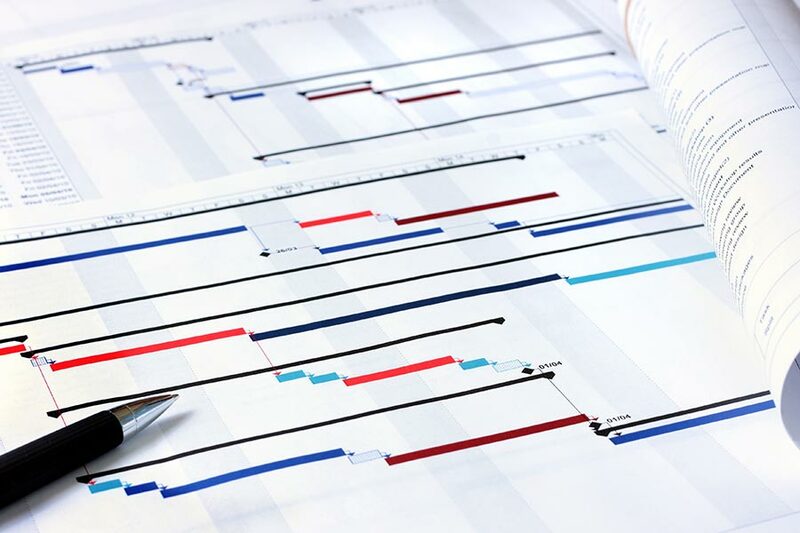 As a certified Project Management Professional for over a decade, I personally use Microsoft Project on Windows, and lately OmniPlan on the Mac to create our construction project plans and manage our projects. Those are what professional project managers use, and they’re not that expensive, however for a free option, you can do very well with the free SmartSheet construction management templates. (We have no financial relationship with them, I just think their templates are top notch). The renovation order of operations in this post is based on our experience in our own flips, which has been informed in no small part by the construction cost-book data used within the REIkit House Flipping Software’s Rehab Cost Estimator, as well as other prior work such as the Construction Specifications Institute’s MasterFormat. Of course a house that needs a light renovation will not have the same needs as an extensive remodel. In some cases, I have learned some hard lessons, and in those cases I will call out some guidance with a “Hard Knocks Tip”. I hope you find this useful, and develop a system that works for you should you continue on beyond your first flip. The weeks leading up to the closing are prime time for you to prepare to rehab the property, and there is a surprising amount to do. That’s right — if at all possible, start preparing for the rehab leading up to the closing, not on the day of the closing. Many items, short of purchasing materials, can be planned ahead of time. It’s also important to remember that many items can be done simultaneously. Based on your scope of work and the order of operations discussed in this post, you should begin arranging your tasks, and lining up your subs to expect work based on your plan. It cannot be stressed enough: No work should begin until the proper permits are in place and you have received a green light to proceed. Choosing to delay or completely work around the permitting process means, at best, a lengthy interruption of work from your city or county when they discover it, and at worst, the inability to sell your flip because the work must be redone and inspected. Make sure you have a clear understanding of what permits are necessary to start work and the expected timeframe in which they will be reviewed. This may mean going down to the permit office in your city and asking them to look over your scope of work. Of course you should also be looking at existing permits (or lack thereof) as part of your closing due diligence process, so you should already be familiar with the permit office when you come back with your new scope of work. If your property is part of an Home Owner’s Association (HOA), the rules of the HOA community are outlined in what is called the Declaration of Covenants, Conditions, and Restrictions (CC&Rs) that you should receive as part of the closing/due-diligence process. This document may contain restrictions on what you can and cannot do to the property. You should get in touch with the association to discuss your scope of work with them and make sure that the rules of the association don’t limit your ability to complete the project. Surveys and engineering reports should also be done in this pre-work/due diligence phase if possible. Earthquake damage for example can often be evident from visual inspection, and if you sense structural damage, this is the time to raise the need for further evaluation by a structural engineer. Look into flood zone issues, whether there is damage from previous floods, and whether there are any requirements necessary to make the property insurable. In California where many homes are built on the sides of hills, you may need to investigate soil conditions. Demolition isn’t all about swinging a sledgehammer to vent out the day’s frustration. Proper demo planning also includes understanding whether there are specific permit and noise ordinances that need to be taken into consideration; whether the HOA will allow the dumpster close to the work; and whether the equipment can reach the site. Additionally, you should identify what can be salvaged, donated and recycled, as opposed to throwing everything in the dumpster. Many local organizations exist that will come and remove re-usable materials, giving you a tax break, and saving you haul-away costs. Similarly recycling can greatly reduce haul-away costs. You would be surprised at how much demo trash even the simplest projects create. At this point you should look into renting a haul-away dumpster for the site to be ready immediately after closing. Dumpsters are not only for big jobs, and you can choose from many sizes of bins to fit your job requirements. If workers will not have a working bathroom or you do not want them to use it while renovations are underway, arrange for a portable toilet to be delivered. Have a locksmith on standby to rekey the locks on closing day. The last thing you need is a surprise visit from the previous tenant. At this time you should have a good idea of materials that you will need to special order to complete the project, be it cabinets or flooring. If those suppliers are not already on your list of vendors, begin interviewing them for pricing, lead-time, and availability. It’s the moment you’ve been waiting for. The closing went through and you can finally start to renovate the property. First, you have to address those issues that threaten you, the property, or make it unsafe to be in or around for your workers. Before anyone steps on your property, protect yourself and make sure that you have adequate builder’s and liability insurance. Construction sites are prime targets for theft and vandalism, involving people looking to score some unsecured valuables such as construction materials, tools, and new appliances. Depending on your scope of work and place of work, all you may need is a keybox, and alarm system, or, on the other end of the spectrum, you may need as much as perimeter fencing with a 24Hr security guard. Before you get workers into a property, you must determine whether it’s safe for them to be there. Only when the structure is safe from shifting or collapse, should you allow any other work to begin. A property, especially one that has been vacant for a while will have issues with pests. Droppings from rodents can pose health risks, and if termites are common in your area and a termite inspection revealed damage, you should get that taken care of to prevent further damage to the structure. Flooding, and water from leaks cause significant damage to almost all structure materials including wallboard, framing, electrical, and insulation. Floodwater is most likely to be contaminated with sewage, or it should be assumed to be contaminated after 72 hours after entry. Therefore water damage creates serious health hazards that should be removed and prevented from re-occurring before any new work starts. After you have completed dry out and have addressed any flooding issues, remove any surface covered with mold. Your municipality may require you to get mold remediation teams on site to remove the areas that are affected. Asbestos was a commonly used construction material for insulation, floor and ceiling tiles, and siding in homes built prior to the 1980’s. Depending on the scope of work you may just be able to cover it up and seal it in place. Otherwise, only professionals should remove Asbestos as it poses serious health risks when not properly handled, or completely removed. Trees can pose serious risks to your crew if they are sick or damaged and overhanging the job site. The time and effort for tree removal depends on many variables including the size of the tree, the accessibility by power equipment, and potential of risk to structures on the property. Once the safety and security risks have been addressed, it’s time to demo. As this is a precondition to getting anything else done, you should perform this task as quickly as possible. Demo is the time when you will uncover the most issues with your project, including additional safety issues, and code violations hiding behind walls. Some items, such as windows and doors, have a long lead-time, 2-3 weeks or more. The same goes with custom tile and any other item that you can’t immediately pick up in stock at a big box store. Order these now. These structural elements include those that comprise the basic blocks of your property. They include foundations, framing, entryways, and the roof, and siding. Foundations often crack and settle over time, letting in water into the basement, and will need to be repaired using sealant to prevent water intrusion, or in the worst case, re-poured. Concrete flatwork includes slabs for sidewalks, driveways, and floors. You should schedule all concrete and flatwork at the same time so keep the trade and equipment rental costs down. Now that you have your poured concrete, you’ll want your carpenters to start framing. This the time to take care of damaged wood from decay, mold, or termites. This is also the time they will also work on reframing any walls, to reconfigure the space, or add or move windows and doors to new locations. Your carpenters should take care of floor beams, as well as adding or shoring up any joists due to room reconfiguration or foundation repairs. Repairing a leaking roof and waterproofing the structure to make sure it stays dry is an imperative first step. If your roof was intact, but old, you may decide to replace it. The roof decking should have been inspected for rot. If it needs to be repaired or replaced this should be done before the new roof is laid down. Most older homes are under-insulated, as they were built when heating and cooling costs were much lower and insulation requirements were less stringent. If you are building an addition or will be adding insulation, you will need proper moisture and vapor control. Moisture control goes on the outside of the house, and vapor barriers will be installed later as part of insulation on the inside walls. With the outside frame of the house exposed, you will need to add a moisture barrier, also known as a house wrap, to prevent water from coming into the house. Windows and doors go on before putting on your siding, as the raw edges will be covered by the siding and trim. It is also much easier to cut siding to fit than to change a window out. Put siding on after installing a new roof as roofers can accidentally scrape or puncture the new siding, or mark it when throwing debris. If you’re looking to refresh a brick exterior, tuck-pointing can be performed now. The sewer lateral runs from under the house to the street. In older homes they are made of clay and are easily damaged by roots. Always do a sewer lateral inspection to check for damage and condition. If it cannot be cleared, then you may need to dig it up and replace it. My preference is to start landscaping as soon as all of the external work is completed to give the plants, or grass time to establish themselves, and thus to make the property marketable sooner. The exception to this is during periods of extreme drought, or in the middle of winter when plants are less likely to survive. One way of scheduling these systems is to have HVAC ducting installed first, followed by plumbing, which is then followed by electrical, which is followed by HVAC system installation. The reasoning behind installing ducting first, is that it is the most bulky and inflexible material, followed by plumbing, which is still somewhat flexible, and electrical last, as it is easy to wind electrical wires around ducting and plumbing. However, the HVAC components themselves will need electrical plumbing before they can be installed. Whether it’s in the middle of winter or the middle of summer, a comfortable temperature in the flip will contribute to comfortable workers. Apart from that, extreme temperatures can affect mortar, paint curing, and many compounds and bonding agents. It’s very important to make sure that the plumbing is inspected and/or replaced, or at the very least tested, before you proceed to any interior finish work. A single cracked pipe leaking water can cause thousands of dollars of repairs to newly installed drywall, ducts and electric if you wait until other work is completed. Try to plan electrical when exterior work is being done or when there are few workers in the house. If the electricity must be turned off, then there will be little impact. Many older homes have knob and tube wiring. If you have the walls opened, then you should rewire. If you do not open walls, check with your building inspector about how much can be kept, as opposed to needing to be rewired. Insulation and vapor barriers will be installed and inspected before the walls are closed up with drywall. After framing is completed and insulation installed, it’s time to close up the walls. Something to keep in mind when it comes to the actual process of drywall installation is the quality of the crew doing the installation. It is very easy to tell a bad drywall job from a good one, as seamless and ultra-smooth walls are very hard to accomplish. Because this is one of the most important aspects of the property, if you are building in a high finish neighborhood, it’s important to get this right, and you should make sure that you use a quality crew. Install ceiling trim, and casings around doors and windows. One of the best tips that I have picked up over the years is to have the crew pre-paint the trim and molding before installation to cut down on the amount of finish work you will have to do. Any interior painting should be done before any final finishing touches, such as installing a vanity and lighting, switch plates and outlet covers and so on. If you choose to have the trim and molding pre-painted before installation, at this point all that is needed is to caulk nail holes and cover with touch-up paint. Your cabinets can go in anytime after interior paint is completed. It is a matter of some debate whether cabinets should go in before flooring or vice versa, and it depends on your specific needs and rehabbing style, and desire to cut costs. In general if the flooring material is pre-finished, put it in after, and if it is unfinished, place it before. New flooring and carpeting are often the last item on the list, for the most part because workers will damage them day to day if put down early. There are exceptions, however. With hardwood flooring, if you are putting down wood floors that are unfinished, you can choose to install the floors before installing kitchen cabinets or a vanity. In those cases you don’t have to worry about preserving a glossy surface. After your cabinets and vanities are in place, you’ll put down tile flooring. It’s also sensible to plan for any other tiling work to be done at this time, such as the kitchen backsplash. Baseboards will go on after all of the flooring to cover up any gaps at the edges. Install any toilets, faucets, and light fixtures at this time. Leave appliance installation to the very end of the project to prevent them from getting stolen. The key to keeping more money in your pocket is in taking the time to plan out your work and do as much as you can ahead of time, as even small rehab jobs can take a long time when not planned properly. Proper planning includes doing as much pre-work as possible before you even close on the house, getting your materials and suppliers lined up, and ordering your tasks so as to minimize delays and re-work. All renovations unfold in different ways and I hope that this post has improved your ability to put together a more efficient schedule to make your next house flip, your best house flip.